Gadzooks it's the Apocalypse! Roleplaying Renaissance Skirmish Rules at the End of Time. 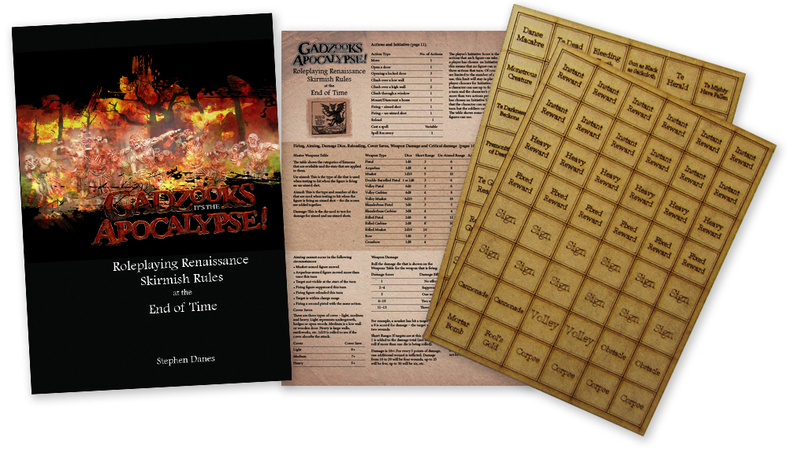 Gadzooks it's the Apocalypse is a fantasy battle game set in the first half of the seventeenth century, a time of widespread warfare, religious strife and general unrest. It was a time when very bad things were happening and when people saw signs of the end of days and the coming of the Apocalypse. So we thought – that sounds like fun times lets make a game! Each player in the game will control one character figure and a bunch of dubious looking henchmen. The character will have a detailed profile, a number of skills and qualities that can be improved upon if scenarios are survived and experience is gained. Henchmen are cheap and expendable and there are always plenty more to hire. But players should beware, evil forces are at work at every turn and as their characters grow in power, the temptation to follow the path of evil will be strong. Will characters risk their humanity by gaining sinister new powers or will they take the path of good. All will have to decide as the end time approaches. Although Gadzooks is clearly a fantasy game with the emphasis on fun and entertainment, I have tried to create a game that delivers an accurate representation of warfare of the period but which also gives a glimpse of some of the religious beliefs held at the time, especially regarding the apocalyptic significance of such events as the Thirty Years War and English Civil War. Belief in witchcraft, demons and other powerful supernatural forces seemed to have been an everyday part of some people's lives – especially those people caught up in terrifying conflicts or suffering from the effects of harsh and poorly understood natural phenomena such as famine and plague. So this game brings these forces ‘to life' – demons and undead creatures roam the battlefield, devilish magic can be conjured by those evil enough to wield it and saints in gleaming armour can hack their way through hordes of foul demonic foes. Now that's what I call entertainment! There are a few reasons why I created this strange fantasy game: I have a definite nostalgia for times spent playing Dungeons & Dragons (and this game is clearly influenced by that classic roleplaying game), I have a great fascination for the early modern era of history and there was a question that kept coming to mind – why are all classic fantasy games set during the medieval period? Would it be possible to create a fantasy game set during the dark apocalyptic days of the seventeenth century? Well my answer to that question is undoubtedly – yes. I hope that after playing this game you will agree with me too. You might want to have someone go over your QRS sheet. You have the claymore doing a d14 in damage and the paragraph explaining how actions work needs some work. Does look entertaining. Impact Miniatures makes a D14! And all the inbetween sizes. Really? Did not know. How many gamers own one? Am I going to need one or more funky dice( beyond the usual suspects, d4, d6, d8, d10, d12, etc, )? If so then that info needs to be noted in his kickstarter. Not trying to crack on the creator, hell I love the concept, just trying to add some constructive advice. Take it or leave it. :) Hello, happy to take on board any constructive comments. Where does it say d14 damage for the Claymore on the QRS? I cannot find it. I can find a d14 save for half-plate. The rules do indeed use a wide variety of dice. Thanks for the interest. Steve. These rules would work pretty well with the minis coming out with the Anno Domini 1666 game. I have started posting updates on the KS page which will begin to explain various aspects of the rules. Starting forces and Initiative so far.